During the last year I've conducted a bushcraft knife field test comparing 15 different robust knives. You can see the test by clicking HERE. One of the contenders was the EKA Nordic W12. Hadar Hallström Kniffabriks Aktiebolag was founded back in 1882 by Hadar Hallström. During the first half of the 1900's about 40 different folding knife workshops were active in the Swedish town of Eskilstuna. 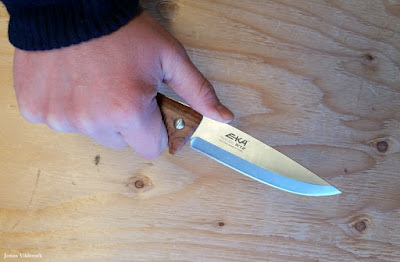 An impressive knife culture that today is represented by EKA-knivar AB. Throught the years a number of classic knife models has been delivered by EKA to satisfyed costumers all over the world. Multifunction models like the 116 was introduced during the 1920's and the Classic series saw the light of day back in the 60's. By the end of the 60's an exiting new material called Plastic enabled the popular Swede series to enter the stage. First out was the all round model Swede 38 designed by Prince Sigvard Bernadotte. The Swede series was a success and since the 70's almost every Swedish household includes a Swede knife. By the end of the 90's the fixed blade knife series named Nordic also made a hit and six years later the smash hit EKA SwingBlade featuring a regular blade and a gutting blade was seen on almost every Swedish hunters hip. Many of the 70's Swede models are still produced, like the Swede 92; the older sibling to one of EKA's latest folder; the EKA Swede 9. One of the latest updated fixed blade products from EKA is the Nordic W12 and at this moment EKA also is expanding their portfolio by adding the tactical products; Axeblade, Hatchblade and Machblade. Through the years the Nordic series has consisted of a number of models but these days the only Nordic still produced is the W12. It's a robust hunting knife made of stainless Sandvik 12C27 steel. The 110 mm long drop point blade is 4,1 mm thick and the sharp spine of the blade is partly jimped. The edge profile of the knife is double edged with two flat bevels, a regular flat grind with a primary bevel of 40°. 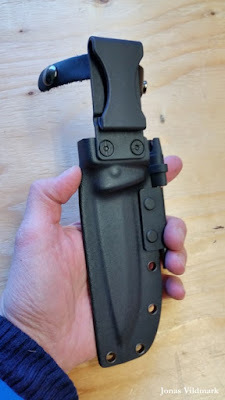 EKA calls this edge profile a "Scandinavian Secondary Bevel" witch can be a bit confusing as usually the definition of a Scandinavian grind is a single beveled V shaped edge profile. The voluptuous handle made of rose wood, EKA calls "Camowood", is attached to the full tang in an interesting way. By removing one single screw you can dismount the knife for cleaning. Unfortunately the sharp spine is protruding over the spine of the handle giving a hot spot when working with the knife for longer periods of time. The old leather sheath are these days replaced by a black Kydex sheath also holding a slim ferro rod combined sharpener. Both the ferro rod/sharpener and a lanyard are included in the package. The ferro rod trows nice sparks but unfortunately I've experienced the ferro rod to slip out of the handle (the sharpener part). But this is quick fixed with some super glue. Also available is a G-10 handled version offered in the colors black and orange. In the model EKA Nordic T12 Black a black tanto bladed version also is offered. Personally I like the older Nordic versions a bit better than the newer W12. But I understand why EKA is holding on to this nice hunting knife model by updating it to be a bit wider used. I'm guessing the manufacturer also wants to appeal the growing bushcraft audience as well as military personnel. As usually the Sandvik steel delivers and after stropping the new knife the edge cuts nicely. As whittling is a big part of my definition of bushcrafting the Nordic W12 ends up in a 14th place in my bushcraft knife field test. The W12 can absolutely process wood but it's after some modifications I personally start to get more comfortable carving with the W12. Foremost I'm referring to the sharp tang along the handle's spine. This I fixed with a grinding belt and some polishing. But also if I could wish for it; EKA should offer the Nordic with a traditional Scandi grind edge. I like the wide specs of this knife as it gives some margins for own modifications. The Nordic W12 is a nice and all round knife I know a lot of Swedes carry with pride. A good companion to share moments of nature with.